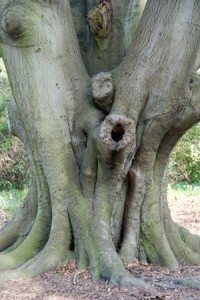 the tree may have cultural or historical interest, perhaps it was used as the gallows! Some veterans have achieved their status through their management, for example, pollarding or coppicing. Others through their position and significance - for example yew trees in churchyards. They can provide information or evidence of former patterns of land use or management. For example, pollarded willows may chart the path of a former river (that has now run dry). 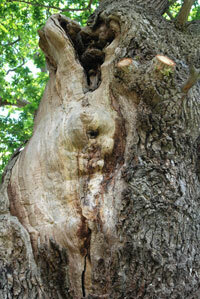 But veterans or ancient trees are often threatened. They may be felled for timber or for safety reasons (heart rot fungi etc) or simply to tidy up woodland. The management of adjacent land may pose a threat through ploughing and use of various agricultural sprays). Sometimes, disease strikes (as in the case of Dutch Elm Disease) or damage to the bark by people or livestock may allow pathogens to enter. Many older trees were lost in the great storm of 1987 (and 1990). In recent times, the UK Biodiversity Action plan has recognised the importance of these mature and interesting trees and their role in managed woodlands, hedgerows and the countryside in general.